Having had asthma as a child due to cigarette smoke and later having a grandfather who died of lung cancer, tobacco is a very evil word to me. 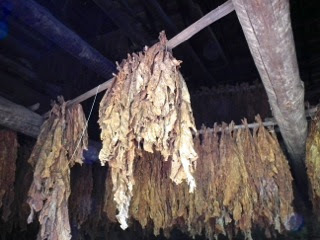 I had no interest in the Tobacco Museum that was at Duke Homestead in the Visitor Center, but the history of tobacco is explained in the photo album as we walked the ground of the homestead taking photos. Washington Duke grew typical crops such as corn, wheat, oats and sweet potatoes, and raised cotton as a cash crop until it failed late in the 1850's, when he began cultivating bright-leaf tobacco. His business began after the Civil War in April 1865 with the help of Washington's children. The company was called W. Duke and Sons and their first product was labeled Pro Bono Publico ("for the good of the public"). How wrong does that look today!? The business grew rapidly. In 1874 the Duke family began mechanical mass production of cigarettes in downtown Durham, being the first to introduce machine-rolled cigarettes to the market in 1884. View the photo album with more detailed information on the history of this place.